EA seems to be living up to its promise of downloadable content and will be releasing Battlefield: Bad Company 2 with day one DLC similar to Mass Effect 2. Last week, the COO of EA, John Schappert, said that all games from Electronic Arts will have an "online component" in 2011. CEO John Riccitiello echoed that this is part of EA's global strategy to shift more towards a downloadable content provider. 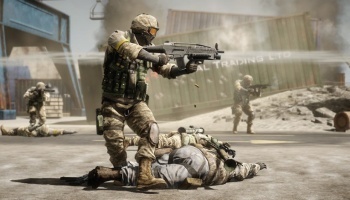 It should be no surprise then that after the success of Mass Effect 2 and its Cerberus Network, that EA will do something similar with its next big release, Battlefield: Bad Company 2 (BBC2). When the highly-anticipated shooter releases on March 2nd, those that purchase it at retail will have access to a VIP code that will provide extra content at no cost. If you buy the game used, however, you'll have to pay a fee to access that same content. EA has not confirmed what that payment will be, but 15 bucks seems to be the standard. "We want people to insert the code they get when they buy the game to get access to [DLC content]," said the producer of BBC2, Patrick Bach. "It's connected to your personal account, more or less, and what we want to do is give you something extra, added value, for that. In the future you will get more content, for free, if you have this VIP code." Bach didn't state what exactly that "extra value" would be, whether it's new weapons or multiplayer maps. Also, because it will be connected to your account at EA.com, it might suffer from the same problems that some users had with the Cerberus Network. In general, I applaud the efforts of publishers trying to eke what value they can out of their IP. But I buy my games new for the most part. For those of you who might be more used games, does this encourage you to buy a game new or just piss you off?